Outspoken T-Mobile U.S. Chief Executive John Legere published a series of predictions on Tuesday for what he thinks lies ahead in 2015 in the wireless industry, and revealed he has big expectations for the upcoming Apple Watch. Legere said he believes the Apple Watch will "mark the tipping point when wearables go from niche to mainstream," he wrote in a new blog post. To him, 2015 will mark the true beginning of the wearables market thanks to Apple, as he believes current devices do not yet show the potential of wearable electronics. The T-Mobile CEO cited a projection from Transparency Market Research, which believes that the wearables market could balloon to $20 billion in sales within the next few years. The Apple Watch is scheduled to become available in early 2015 with a starting price of $350, though Apple has not provided any more specific details. The company's highly anticipated entrance into the wearable devices market will initially be limited to iPhone users, as the Apple Watch requires connection with an iPhone for regular use. In his post on Tuesday, Legere also touched on the growing market for so-called "phablet" style smartphones— a space that Apple entered this year with its 5.5-inch iPhone 6 Plus. T-Mobile's leader said he expects that phablet sales will continue to grow in 2015, and predicted that sales will rise at least 50 percent next year. Growing demand for phablets will continue to cannibalize the tablet market, Legere believes. He also said that larger form factor smartphones will further drive demand for mobile data use. Since taking over the wireless carrier, Legere has earned a reputation for being outspoken and honest, helping to grow T-Mobile's customer base against rivals AT&T, Verizon and Sprint. He also predicted Tuesday that T-Mobile will officially become the No. 3 largest wireless carrier in America next year, surpassing Sprint thanks to its continued focus on so-called "Un-carrier" strategies that are pro-consumer. In its latest announcement, T-Mobile revealed it will begin rolling over unused data from month to month, rather than resetting the cap for each billing cycle. Each Data Stash plan will start with 10 gigabytes of 4G LTE data for free through Dec. 31, 2015. 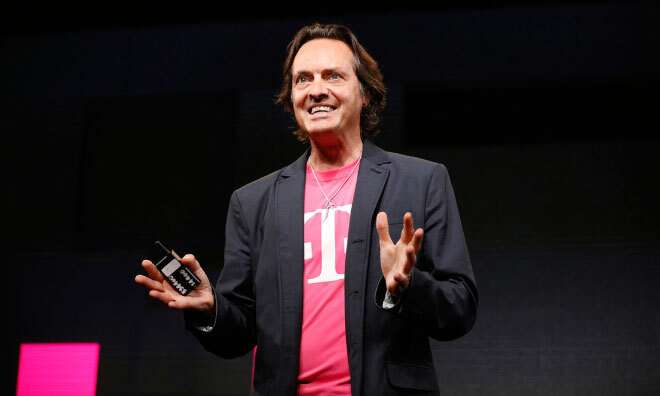 Legere, the mastermind of the "Un-carrier" strategy, has said he's been blown away by consumer demand for the iPhone 6 and iPhone 6 Plus, which launched in September.